DC TV PODCASTS: SPINAL CORD RESEARCH FUNDRAISER ON JUNE 11! Podcasters assemble to help cure spinal injuries in a live marathon event. Tuesday, May 31, 2016 – The DC TV Podcasting Network is teaming up with the Christopher & Dana Reeve Foundation to help cure spinal cord ailments on Saturday, June 11, 2016. Founded by the late Man of Steel himself, the mission of the Christopher and Dana Reeve Foundation is to discover and fund innovative research as well as improving the quality of life for people who live with paralysis. We here at DC TV Podcasts couldn’t be more proud to be partnering up with the Foundation for this important cause in advancing research for spinal cord injuries. Here is how you as a listener can help and participate on Saturday, June 11, 2016, while also enjoying your favorite DC television podcasts for Arrow, The Flash, Gotham, Supergirl, Legends of Tomorrow as well as DC Movies. The podcasting fundraising event will be hosted via Mixlr at mixlr.com/dctvpodcasts and will begin at 11 AM PST/2 PM EST. The event will feature the great minds of DC TV Podcasts with hosts from Quiver: The Green Arrow Podcast, The Flash Podcast, Legends of Gotham, Supergirl Radio, Legends of Tomorrow Podcast and DC Movies Podcast. The event will continue from 11 AM PST/2 PM EST into the evening with all six individual shows. The marathon will then conclude with a special DC TV Podcasts Assemble show featuring hosts from all six podcasts. Quiver: The Green Arrow Podcast at 11 AM PST (2 PM EST) with Michael Cohen and Amanda Konkin. DC Movies Podcast at 12 PM PST (3 PM EST) with Chris Doucher and Ashley Robinson. Supergirl Radio at 1 PM PST (4 PM EST) with Rebecca Johnson, Carly Lane and Morgan Glennon. The Flash Podcast at 2 PM PST (5 PM EST) with Andy Behbakht, Lauren Gallaway and guest host Jason Inman. DC TV Podcasts: Assemble Show at 5 PM PST (8 PM EST) with multiple hosts of DC TV Podcasts TBA. Starting today, as well as during the marathon, head over to DCTVPodcasts.com/Fundraiser to find out how you can make a donation to the Christopher and Dana Reeve Foundation. We at DC TV Podcasts hope to see you in the live chat and enjoy all the exciting programming we have in store for you! Nothing would make us happier than our listeners donating to this significant cause and joining us at DC TV Podcasts in helping the Foundation in funding cures and research for paralysis. DISCLAIMER: Any podcasts that are represented on DC TV Podcasts are fan podcasts and are not affiliated with DC Comics, Warner Bros. TV, Warner Bros. Pictures, DC Entertainment, The CW, and FOX. FOR NEW CW ARROW/FLASH SPIN-OFF SERIES! New Fan Podcast Dedicated to the Upcoming DC’s Legends of Tomorrow TV Show on The CW. 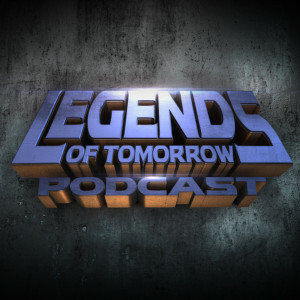 Thursday, May 14, 2015 – DC TV Podcasts, which is a podcast circle for multiple high-quality DC Comics TV dedicated podcasts, is expanding its family with the addition of a 5h podcast that will be launching through DC TV Podcasts: the Legends of Tomorrow Podcast! Legends of Tomorrow Podcast is a fan podcast devoted to the upcoming DC’s Legends of Tomorrow TV show on The CW, an Arrow/The Flash team-up spin-off created by the creators of Arrow, The Flash, Supergirl creators Greg Berlanti, Andrew Kreisberg as well as fellow Arrow creator Marc Guggenheim. Legends of Tomorrow Podcast will be helmed by a legendary trio: Tony Kim (Moderator, Web-Master of Crazy 4 Comic Con, Gregg Katzman (Freelance Writer) and Kat Calamia (Host of Comic Uno and Comic Frontline), all of whom have made names for themselves individually in the world of pop culture, and will now be joining forces to celebrate the arrival of the Legends of Tomorrow. This fan podcast will begin with a “Season Zero” – as The Flash Podcast did, which Supergirl Radio is currently doing – sometime in May with an episode that will tell the listeners more about the hosts as well as discuss what is known thus far about DC’s Legends of Tomorrow. Starting in the summer, the listeners will get to join the journey and discover more about the characters that Legends of Tomorrow will be featuring such as Kendra Saunders/Hawkgirl, Rip Hunter and many more. Once Legends of Tomorrow debuts on The CW sometime between January/February of 2016, Legends of Tomorrow Podcast will become your one-stop shop for all things related to the series. Andy Behbakht, host of The Flash Podcast, is a producer on the show and will work behind the scenes with our trio of hosts. Legends of Tomorrow Podcast “Season Zero” will provide an in-depth exploration of the main characters from Legends of Tomorrow in the DC Comics Universe, dissecting both past interpretations of the characters and the current New 52 versions throughout the season, episodes dedicated to iconic storylines and big events that have involved some of the characters. There will also be focus on as many of the characters in other media in which they have appeared, from movies to television and much more! DC’s Legends of Tomorrow is an upcoming superhero team-up drama by Greg Berlanti (Arrow, The Flash, Supergirl), Andrew Kreisberg (Arrow, The Flash, Supergirl), Marc Guggenheim (Arrow) and Sarah Schechter Arrow, The Flash, Supergirl, upcoming Pan), that will be bringing together heroes and villains from CW’s hit shows Arrow and The Flash to face one big threat. DC’S LEGENDS OF TOMORROW stars Victor Garber (The Flash, Alias) as Dr. Martin Stein; Brandon Routh (Arrow, Superman Returns) as Ray Palmer/The Atom; Arthur Darvill (Doctor Who) as Rip Hunter; Caity Lotz (Arrow) as Sara Lance/White Canary; Ciarra Renee (Pippin) as Kendra Saunders/Hawkgirl; Franz Drameh (Edge of Tomorrow) as Jay Jackson; with Dominic Purcell (The Flash, Prison Break) as Mick Rory/Heat Wave; and Wentworth Miller (The Flash, Prison Break) as Leonard Snart/Captain Cold. Based on the characters from DC Comics, DC’S LEGENDS OF TOMORROW is from Bonanza Productions Inc. in association with Berlanti Productions and Warner Bros. Television. Legends of Tomorrow Podcast is a fan dedicated podcast and is not affiliated with DC Comics, Warner Bros. Television or The CW. DC’s Legends of Tomorrow & all logos and artwork are trademark of DC Comics and DC Entertainment. DC TV Podcasts is a podcast circle that features a collection of high-quality and popular podcasts that are devoted to DC Comics television series including The CW’s Arrow and The Flash, FOX’s Gotham, CBS’s upcoming superhero drama Supergirl and more! Join the hosts of Quiver, The Flash Podcast, Legends of Gotham and Supergirl Radio every week for the best news, commentary and opinions about these comic book shows.